Mr. Chancellor, Meeru Dhalwala and Vikram Vij are superb examples of the power of global thought and local action. They are well-known, both within this community and beyond, as award-winning restaurateurs, chefs and best-selling cookbook authors. But what is less well known is their extraordinary contribution as social entrepreneurs to the business, art and science of creating sustainable food systems – systems that not only meet local needs, but are models for replication in other parts of the world. For many years Ms. Dhalwala has worked to create large networks of local farmers and suppliers; to provide respectful employment opportunities for immigrant women, and to provide leadership to local sustainability organizations. I am particularly pleased to note that she is the founder and organizer of Joy of Feeding, the annual international food fair at UBC Farm. She has also been a fundraising leader for the Centre for Sustainable Food Systems at UBC Farm, and is currently a mentor for Social Entrepreneurship students in the Sauder School of Business. One of Vancouver’s best-known culinary figures, Vikram Vij has been a torchbearer for optimizing both the quality of locally produced food and the sustainability of local food production. To that end he championed the Vancouver Aquarium’s Ocean Wise Sustainable Seafood program, which today has over 600 partners and educates and empowers consumers all across Canada about issues surrounding sustainable seafood. He has long been an active supporter of the UBC Farm, and an advocate of using food as a medium for learning and cultural integration. In 2013 his vision and generosity culminated in the creation of Vij’s Kitchen in the Faculty of Land and Food Systems, a learning space for basic food theory, food preparation, and for multicultural culinary exchanges. 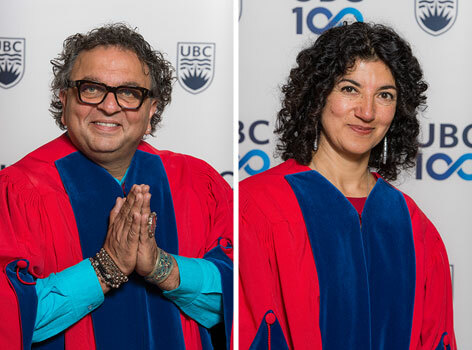 Mr. Chancellor, in recognition of their global awareness and local action, and of their overall contributions to human well-being, I ask you to confer the degree Doctor of Laws, honoris causa, upon Meeru Dhalwala and Vikram Vij.